Shazam! doesn’t feel like a DC movie. I mean this in the best possible way, and I don’t even mean this as a dig at the DC films released thus far. This is not because where those films are dull, this film crackles with wit and whimsy; or where they were cynical, this shines with hope. I mean this more because DC’s latest owes more of a debt to the 80’s kid’s adventure The Goonies than to the big-budget catastrophe of Justice League. For a film sharing its world with Crustacean armies and Supermen, the tone of Shazam! stays firmly on the ground with the everyday people. Shazam! 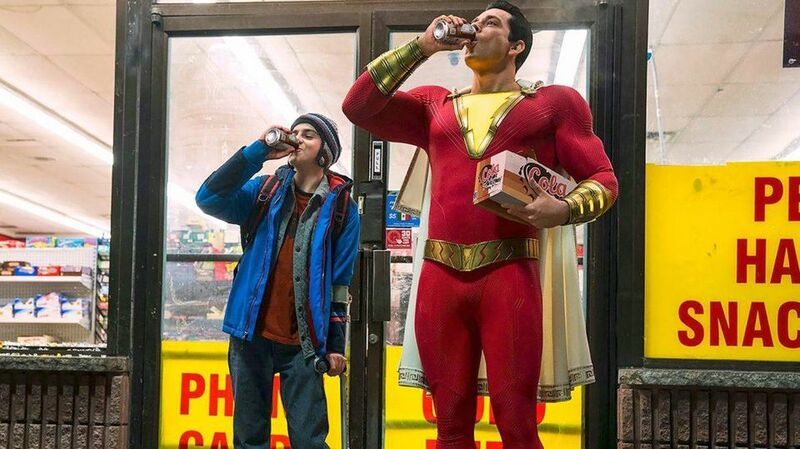 takes all the wish-fulfilment of a superhero narrative; one where a disenfranchised foster kid gets the ability to turn into a superpowered grown-up, and focuses more on the kid stuff than the superhero. It’s a decision that pays dividends; Shazam! is an utter delight. Our hero is fifteen year old Billy Batson (Asher Angel), a perennial runaway on the hunt for the mother who abandoned him as he’s welcomed into a family of five foster kids, each more precious than the last. Billy is whisked away to a cave where an old wizard named Shazam, (played by Djimon Hounsou with a frankly ridiculous urgency and force), deems Billy his “pure-hearted” heir. Billy is given the ability to transform himself into a handsome 30-something superhero (Chuck‘s Zachary Levi) with a single word: the Wizard’s name, Shazam. Mark Strong plays a 2D villain, Dr. Sivana, a rejected candidate for Shazam’s power, with distinctive aplomb; it may not be the best role in the actor’s career, but boy is he loving it. The villain releases the “Seven Deadly Sins”, CGI creatures that manage an air of spookiness (Gluttony’s belly splitting in half is of particular note). These villains somehow bring legitimate stakes to the narrative, and the third act action set-piece is the film’s crowning achievement, in stark contrast to most examples in the genre. The film, at its core, is for and about kids. Billy’s disabled foster brother Freddy Freeman (It standout Jack Dylan Grazer) is at the heart of the film. His superhero fandom ironically grounds the superhero elements of the world into a plausible reality. He helps Billy figure out his powers and many terrible superhero names (a legal hullabaloo led to the film not being able to use Shazam’s original superhero name, Captain Marvel). Oddly enough, the fact that Shazam! is set in a world already populated with superheroes allows it to be different. Freddy’s deep knowledge of DC lore takes for granted that Billy is a superhero, which frees the film up to spotlight more interesting things, like showcasing the foster home. It’s not a particularly good-looking film though. Philadelphia is mostly filmed on another grey day in Toronto, and the ‘Rock of Eternity’ (Shazam’s ancient lair) is nowhere near as interesting or grand as it should be, which is a disappointment after James Wan’s stylish (if nothing else) Aquaman. I reviewed Justice League for this publication at the time of its release, and, while I can now admit that my initial take was wrong (that movie is indefensible), I stand by my statement that what makes these films work is not spectacle, but the content of their characters. Shazam! is filled with adventure, scares and whimsy, but, most importantly, it has truly good characters at its heart. It’s not a perfect movie by any means, and its visual style is a little colourless for the four-colour hero it contains. But you’re not here for that. As is the case with the best superhero movies, it’s the characters that make it worth seeing.